When it came to racial inclusivity, however, New York designers — surprisingly — edged backward. We tallied 110 shows and discovered that 69.7 percent of the 2,973 model castings were white and 30.3 percent were nonwhite. That’s a slight regression from Fall 2016 where models of color accounted for 31.9 percent of castings. 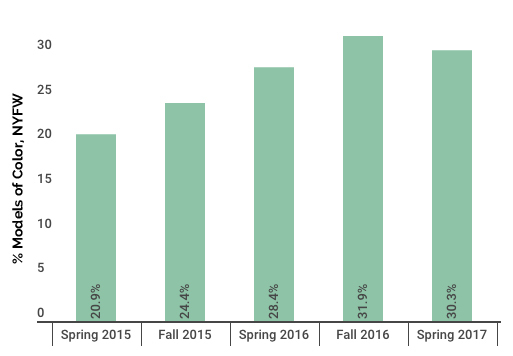 Spring 2017 was markedly more diverse than Spring 2016, however, which only saw 28.4 percent nonwhite models and Fall 2015, when the number of nonwhite models cast just missed the 25 percent mark. The CFDA guidelines seemed to have gotten lost in the mail for some designers, most notably Mary-Kate and Ashley Olsen. Out of the 20 models who walked for The Row, not one woman of color showcased the former Womenswear Designer of the Year’s wares. Australian swimwear tycoon Zimmermann featured but one model of color in its 24-strong lineup, earning a paltry 4 percent diversity score. Vivienne Hu hired one model of color out of 18, making its runway 6 percent diverse. Delpozo only booked two nonwhite models out of 26 for an 8 percent diversity score. Finally, Nicole Miller cast just three models of color out of 30, leading to a 10 percent diversity ranking. On the flip side, several brands embraced diversity in new and striking ways. Brandon Maxwell bested his Fall 2016 diversity score, casting 69 percent models of color (up from 53 percent). The Blonds and Rebecca Minkoff also stepped up, casting 61 percent and 62 percent models of color, respectively. Shocking us only on a sartorial level, Kimora Lee Simmons’ Midwest-infused show featured 82 percent models of color. Peddlers of inclusive neutrals like Kanye West — we won’t get into his irresponsibly worded casting call or lack of humane working conditions at his show — and Telfar continued to hire a majority of nonwhite models. 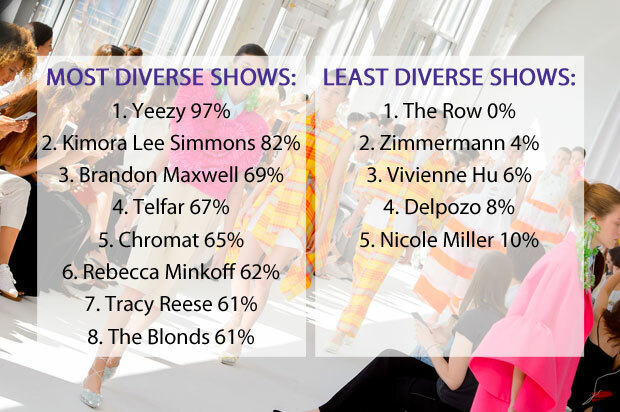 The Yeezy designer sent 97 percent models of color down the runway (note: this figure does not include the “multiracial” women teetering on the lawn), while 67 percent of Telfar models were nonwhite. Chromat, too upheld its commitment to diversity. 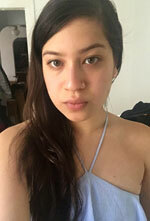 Although its overall diversity ranking fell to 65 percent (down from 85 percent for Fall 2016), the masters of structural experimentation cast seven plus-size models (including one Ms. Iskra Lawrence), four transgender models (Carmen Carrera, Leyna Bloom, Aurel Haize Odogbo and Maya Monès) and was the only brand to feature a disabled model, namely TSS survivor, amputee and activist Lauren Wasser. J.Crew eschewed professional casting agencies altogether, enlisting friends, family and staffers to model its offerings — men and women of all different ages, ethnicities and non-straight sizes. Tracy Reese, who recently announced that her collections will henceforth include a wider range of sizes than ever before, also diversified her roster with non-models — “philanthropists, advocates, musicians, dancers, singers” — from whom she draws inspiration. It’s worth noting that three plus-size models and three older models walked in Reese’s show, which, with its 61 percent racial diversity ranking, was one of the most inclusive this season. Finally, Christian Siriano, the veritable champion of curvy women on the red carpet and beyond, cast five plus-size models (Marquita Pring, Alessandra Garcia Lorido, Precious Lee, Sabina Karlsson and Georgia Pratt) alongside 34 percent models of color in his Capri-themed fashion show. 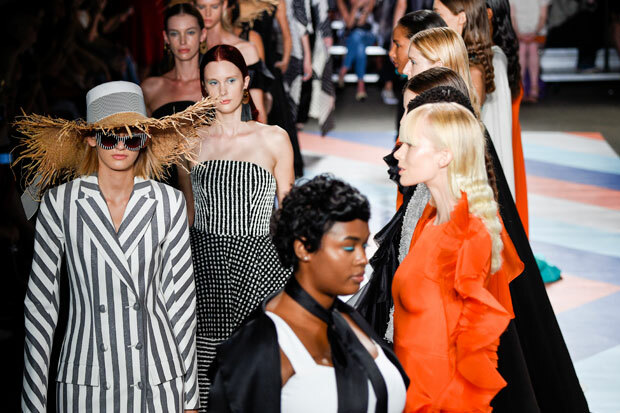 Overall, we are much aggrieved to report that, for the first time since our inaugural runway report in Spring 2015, the industry’s gradual trend toward diversity has faltered. Furthermore, New York typically leads the charge toward inclusion, so we would not be surprised if the global statistics for Spring 2017 prove even more discouraging. That said, there are many silver linings to be seen. For one, this was the most body-positive New York Fashion Week ever with 16 plus-size models walking the runways. We saw eight transgender models, matching the Fall 2016 tally and besting the singular casting in the recent spring ad campaigns. In addition, although the number of appearances by models over 50 fell to eight (down from 11 for Fall 2016), the designers who booked them rose in pedigree. From luxury purveyors like Ralph Lauren, Michael Kors and Tom Ford to indie favorites like Rachel Comey, Opening Ceremony and Eckhaus Latta, big-name brands underscored the fact that grace and beauty know no age limit. 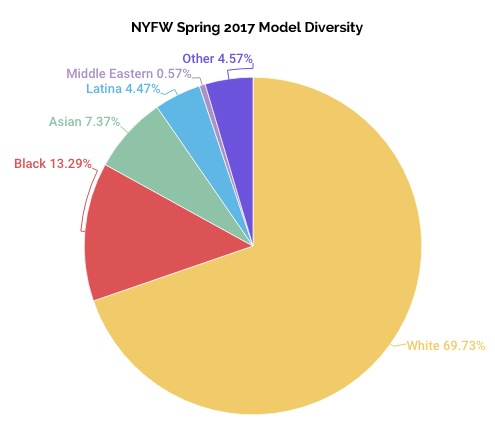 Finally, of the most-booked models for Spring 2017, 4 out of 10 were nonwhite. More on that encouraging statistic here and stay tuned for our full Spring 2017 diversity report, coming at the end of Fashion Month. UPDATE 10/10/16: This report has been updated to correct an error that mislabeled a Latina model as White. This correction changed the original diversity findings of 30.1% to 30.3% racially diverse. Additional reporting by Theodore Gill. Models of color were categorized as those who appear to be nonwhite or of mixed backgrounds. Models included in the Latin category are classified as nonwhite Latins who do not appear to be strongly Afro-Latin. Models included in the Other category are classified as nonwhite models of mixed or unidentified backgrounds.